The results of the previous steps are shown. The phosphate has moved to ATP and 3-phosphoglycerate is also left behind. For each glucose that started glycolysis there are two glycerates. so 2 ATP are made for each of these reactions. Our total ATP for glycolysis is now even. It took two ATP to get the pathway started (1 for hexokinase, 1 for phosphofructokinase-1). Now those two ATP have been returned. In terms of what the organism needs most.. energy transfer from sugar to ATP we are now even. Starting from standard state and allowing the reaction to come to equilibrium the 3-Phosphoglycerate and ATP concentration would end up ~200 times higher than the product of the concetrations of 1,3bisPhosphoglycerrate and ADP. The Standard Free Energy favors ATP production - the reason for this is outlined above. The high concentration of ATP and the low concentration of ADP "conspire" to take away the thermodynamic advantage of this reaction... but in spite of the "concentration problem". this step still manages to eke out its living... just barely. Glycerate Kinase. 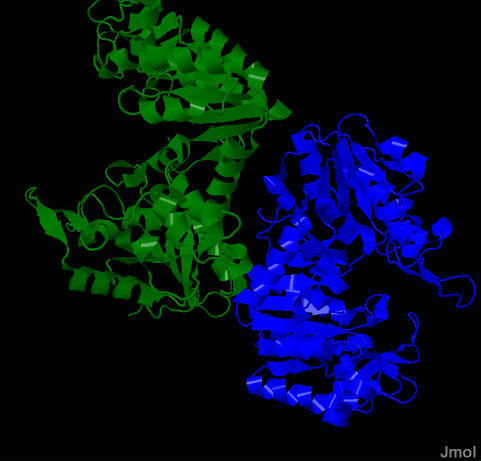 Animation of the Glycerate Kinase reaction Blue: represents the enzyme. "Start" begins an animation of the group transfer reaction. It proceeds through the reaction in the "forward" direction and then "backwards" again. Note how the enzyme is involved. "+" increases speed while "-" decreases the animation speed. You may also step through the reaction using "next" or "previous"